time this tradition has been adapted and amended. Some of these adaptations have helped preserve the core message, while others have obscured it. That message is rooted in the covenant God made with Abraham and Sarah that through their descendants the nations would be blessed. The message contained in this covenant was renewed in the ministry of Jesus and then passed on to us. Whenever this calling gets obscured, God finds a way to call us back to this founding vision. In our reading from Revelation, the Son of Man invites the Ephesian church to “remember then from what you have fallen; repent, and do the works you did at first” (Rev. 2:5). This call to repentance is a call to reset our lives to the original vision. To use a computer analogy, whenever the system gets overly corrupted, it’s time to reset the system by restoring it to its original factory settings. And so it is with the church. When we forget who we are and what we’re called to do, then it’s time to hit the restore button. If this computer analogy doesn’t work for you, then picture in your mind an old church building whose walls were once covered with vibrant colors and designs. But, over time the congregation decided that things needed to be modernized so they painted over the designs with a rather dull coating of paint. Then one day when the church decided that the sanctuary needed a new coat of paint to replace the dirty and faded paint that covered the walls, the crew stripping away the old paint discovered this long forgotten original design lying underneath. As they made this discovery, they knew they had to restore the building to its original glory. If we look closely at Christian history, we’ll find many examples of reform movements that emerged at just the right time to call the church back to its original vision. One of those movements was our own Disciples tradition, which has strong restorationist elements. 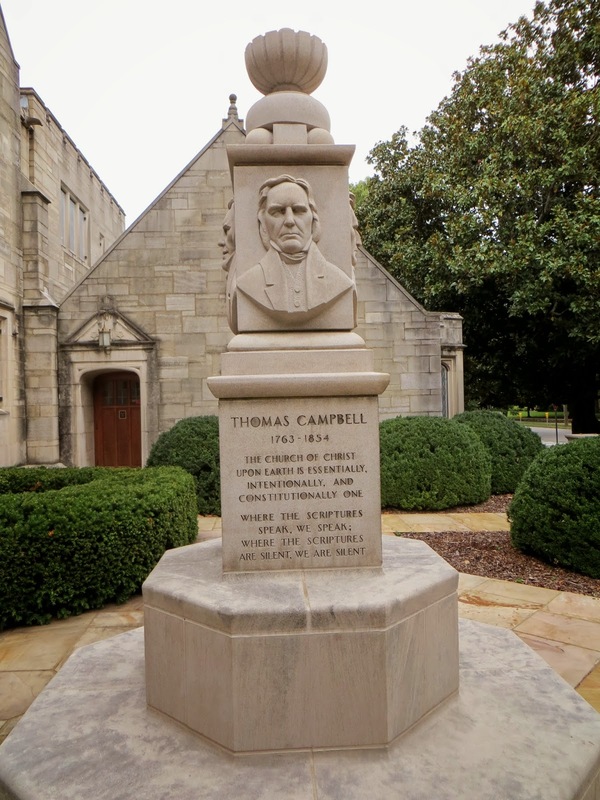 Thomas and Alexander Campbell believed the church had strayed from Jesus’ original vision and felt called to take the church back to the Bible by peeling away the accumulated “stuff” that now obscured the church’s sense of purpose. Of course, we Disciples aren’t the only restoration movement on the block. There have been many others as well. One of these restoration movements is Pentecostalism. Like our Disciple ancestors, Pentecostals looked to the Book of Acts for guidance, and when they read this book, they saw a people empowered by the Holy Spirit who did miraculous works. They decided that the modern church needed this spiritual restored, if it was going to be faithful to the calling of Christ. 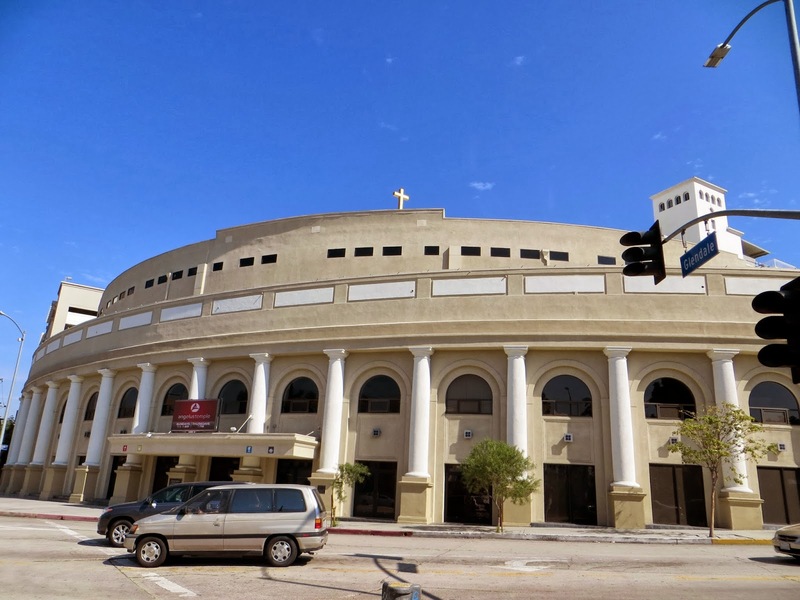 During our visit to Southern California in October, Cheryl and I stopped in at Angelus Temple, which Pentecostal evangelist Aimee Semple McPherson built in the early 1920s, so I could reconnect with another part of my spiritual journey. During my high school and college years, after I was an Episcopalian and before I became a Disciple, I was a member of the denomination Aimee founded. That denomination is known as the International Church of the Foursquare Gospel. Aimee’s theology is different from mine in many ways, but her restorationist vision, which she shares with our Disciple ancestors, is a call to let God reset and restore the church to its founding vision. 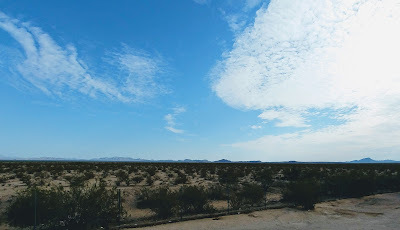 Aimee’s vision does look back in time, but because it is an eschatological vision, it also looks forward. Merely pining for what was, is nothing more than nostalgia. Like the Campbells and Barton Stone, she understood that the work of restoration needs to move us into the future so we can experience full communion with the living God. That is, I believe, what she meant by pushing on toward the perfect. The goal set before us is to participate in the blessings of God as the realm of God is revealed to us. In Revelation 2, the Son of Man, standing in the midst of the seven lamp stands, representing the seven churches of Asia, speaks this word of hope to the angel assigned to the church in Ephesus: “to everyone who conquers, I will give permission to eat from the tree of life that is in the paradise of God” (vs. 7). That is, if we hold firm to God’s calling we’ll eat of the Tree of Life standing in the center of the Garden. Although the Son of Man commends them for their hard work, he also brings a word of warning. Yes, these are good, hard-working people who resist evil and don’t even get weary from their work. This is a faithful community, but something important is missing and so they’re in danger of having the light of the Spirit removed from their lamp stand. What is missing – is their first love. Yes, they “abandoned the love [they] had at first.” We’re not told how this happened, but they’re told to repent and return to the works of love that originally marked the community. In other words, the Son of Man was telling the angel of this church to press the reset button. We might not have the details, but I think anyone who has been in a long-term relationship knows that the ardor of love can diminish over time. When you’re in the early stages of your relationship you bring gifts to each other and spend as time as you can with each other. But as time passes, you might begin to take your partner for granted. You do the expected. You might send flowers on a special occasion like an anniversary, but rarely if ever do you send flowers just because you want to say I love you. Cheryl might remember a young man showing up on her doorstep, bearing a flower – most likely a carnation because a rose was too expensive for that poor seminarian – even though this young man should’ve been studying for his finals. Yes, young love will do that kind of thing to you. Although the Ephesians seemed to be doing the right things, the love that they had been known for in the beginning was now missing. In the beginning their faith was expressed in love for God and for their neighbor. But now, it seems to have disappeared. They had lost their focus. They had forgotten the truth that Paul had shared with the Corinthian church. That is, without love we gain nothing. Only love endures, and therefore it is the better way (1 Cor. 13). Despite all their hard work and their attempt to be faithful, they had missed the point of their calling. They were religious, but not spiritual. God alone is holy and worthy of our glory and praise. All the good things that can come of worship – education, church growth, cultural relevance, social change – seem to disappear the moment they become the primary goal, though each may be an outcome of worship truly done. [Worship for the Whole People of God, p. 266]. By resetting or restoring the church to its founding vision, we turn our focus back to the God who first loved us, so that we might love one another. In this, the nations receive their blessing, which is to taste the fruit of the Tree of Life.